Catch your own live minnows, shiners, chubs, suckers, etc. Mirror Lake is an intermediate-sized natural lake in the western High Uintas. It is one of the most familiar natural mountain lakes in the state. The Mirror Lake Highway is named after it. It gets its name due to the near perfect reflection of the surrounding mountains and trees you get by gazing down at it from a roadside overlook, or from the shore. The shoreline is owned by the Wasatch-Cache National Forest, and has full public access. 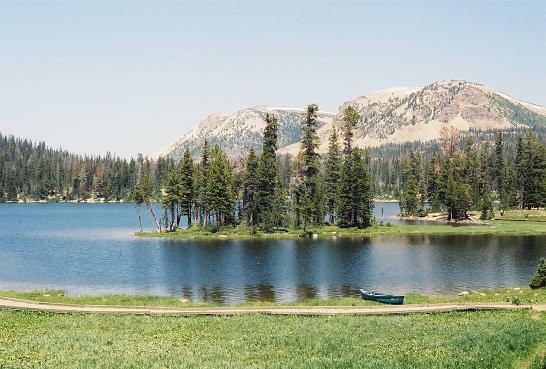 Mirror Lake includes the adjacent Mirror Lake Campground, with latrines, day-use areas and 94 campsites. The water that enters the lake is overflow from Pass Lake located just above Mirror Lake. The outflow is the headwaters of the Duchesne River. Located on Hwy 150 (Mirror Lake Hwy) about 31 miles east of Kamas. Disclaimer: Always check the latest regulations from the current year fishing guide before fishing any Utah water. Information here is kept as up to date as possible but cannot be guaranteed. Copyright © UtahFishingInfo.com All rights reserved.